Victorian America had fashions in house design, exactly as we have fashions in clothing or hair style — except that well-to-do Victorians took the design of their homes far more seriously than we take our hair. The Victorians were highly status-conscious, and in Victorian America, nothing displayed your status like your house. House fashions literally started at the dinner table. By our standards, most wealthy Victorians spent an incredible amount of time socializing: it was not uncommon for them to either attend or host a dinner party 2 to 5 times a week. Victorian dinners were formal and long, consisting of many courses served over as much as three hours. Afterwards, the gentlemen would retire to the game room for cigars, brandy, and billiards or cards, while the ladies would retire to the drawing room for needlepoint, possibly music, and have sherry or tea. In short, your social circle saw your house a lot, so it was important that the house be impressive — that is, designed in the latest fashion. The house of a successful Victorian family was more than merely a home; it was a statement of their taste, wealth, and education. The Gothic Revival was the first and most important of the many house fashions to sweep Victorian America, starting in about 1840. This style harked back to medieval castles and cathedrals, and its growth in popularity came simultaneously with romantic movements in all the arts — that is, simultaneously with the infamous Victorian taste for melodramatic music, plays, and novels. It was an odd Victorian who saw any essential difference between enjoying a romantic novel by Sir Walter Scott, set in a never-never land of knights and castles, or building an expensive house in that same style. The Gothic Revival house is characterized by steeply pitched roofs, pointed-arch windows, elaborate vergeboard trim along roof edges, high dormers, the use of lancet windows and other Gothic details, and board and batten siding, often set vertically rather than horizontally. The greatest concentration of classic Gothic Revival houses is in New England — but the more modest "folk Victorian" houses which were built by working-class Victorians eventually became so ubiquitous that it is almost impossible to imagine an America not covered coast-to-coast with them. 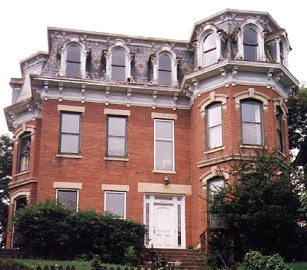 In midwestern farming communities in particular the style exhibited incredible durability, and (in Folk Victorian form) was still being built as late as the 1940's. The next fashion was the Italianate, so-called because it looked to the country villas of northern Italy for its inspiration. The style was characterized by a rectangular massing of the body of the house, often arranged picturesquely into assymetric blocks to imitate the sprawling look of centuries-old villas in Italy that had been modified and enlarged by many generations. The style also featured low-pitched, often flat roofs; heavy supporting brackets under the eaves, often elaborately carved; and windows with heavy hoods or elaborate surrounds. The style often features a square tower or cupola, in which case it is sometimes referred to as "Tuscan". 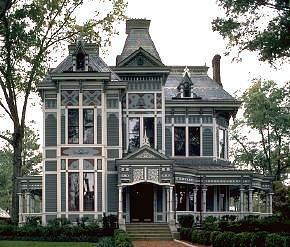 Although very elegant and even grand Italianates are fairly common in the East, Midwest and on the West Coast, this particular Victorian style is fairly rare in the deep South. The time of the greatest popularity for the style, the 1860's and 1870's, coincided with the economic devastation brought on by the Civil War, and there were few in the post-war South who could afford to build expensive new houses then. The Second Empire style was fashionable at about the same time as the Italianate, but its popularity was more spotty geographically. Most large cities in the industrial Northeast and the Midwest have many examples, but the style is fairly uncommon in the South and on the West Coast, and quite rare in the Rocky Mountain States. 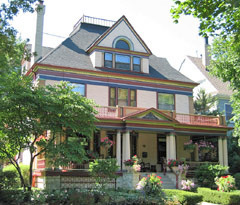 The next major Victorian house style was the Queen Anne, which so utterly dominated Victorian residential architecture from 1880 to 1910 that it is now virtually synonymous with the phrase "Victorian house" to much of the public. The Queen Anne style at its most extreme is characterized by bewildering excess, featuring large projecting bay windows, towers, turrets, porches (often on multiple stories), balconies, stained glass decoration, roof finials and crestings, walls carvings and/or inset panels of stone or terra-cotta, cantilevered upper stories, acres of decorative trim, patterned shingles, belt courses, elaborate brackets, bannisters and spindles — even the chimneys on Queen Anne houses are spectacularly crafted, as the photo here shows. 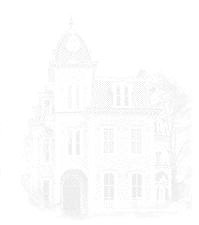 However, subsequent generations mostly reverted to the all-white paint scheme that had characterized houses before the Civil War, and thus it came as a shock — nearly an outrage to some — when the "Colorist" movement of the 1960's and 1970's set in, and a few people began painting their Victorian houses in rich colors again. The movement spread, and today (at least in some parts of some cities) Victorian houses sporting three or four bright colors are once again the norm rather than the outrageous exception. 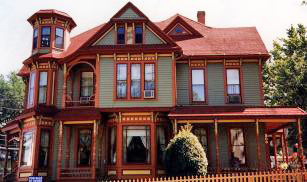 Relatively few modern homeowners try to duplicate original Victorian colors, partly for reasons of expense but mostly because bright colors are often preferred by modern eyes over the darker colors used by the Victorians. A few purists tsk-tsk at this, but personally, I think the Victorians would approve. If there was any generation which wanted to stay fashionably current, and would heartily endorse anybody's efforts to do exactly the same, it was surely the Victorians. 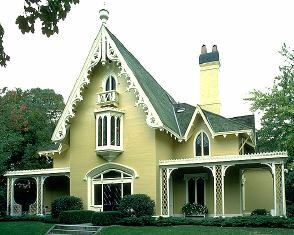 The Stick Style, popular from about 1860 to 1890, is sometimes considered to be a High Victorian elaboration of the Gothic Revival style, and/or is considered to be a transitional style between the Gothic Revival and the Queen Anne. Whatever the classification, the style is sufficiently distinct to deserve separate mention. 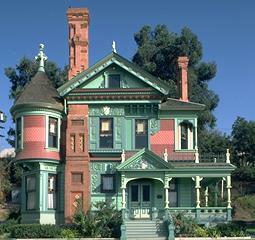 Exotic houses enjoyed a certain popularity throughout most of the Victorian period. There was always the occasional eccentric willing to build something that looked like an Arabian palace or an Egyptian temple. This impulse sprang from more-or-less the same romanticism that led more conventional Victorians to build houses patterned after Gothic cathedrals, or Italian villas, or French mansions — it was just a bit more idiosyncratic. 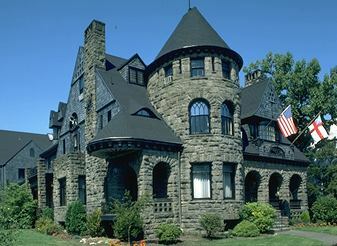 The Romanesque Revival style was very nearly the creation of one architect, Henry Hobson Richardson. The style was built exclusively in stone and featured massive, often rustic-looking construction, along with heavy arches on the porches, doors, and windows, and a near-complete lack of applied decorative detail. Richardson created (or at least popularized) the style shortly after the Civil War, and it enjoyed its greatest heyday in the 1880's, when other architects began to employ it as well. 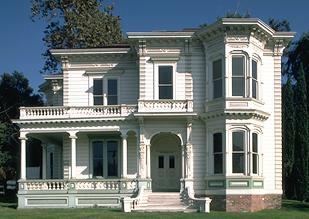 The last of the Victorian styles was the Shingle Style, built from about 1880 to 1900. As the name indicates, the style is distinguished by the fact that the house is covered nearly 100% by shingles, sometimes including even the porch pillars. The style also features little to no external decoration, roomy porches, and a complex roofline. 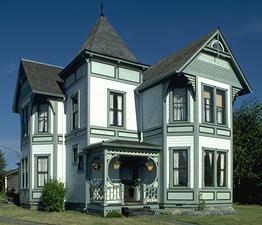 The most common Victorian style is Folk Victorian. 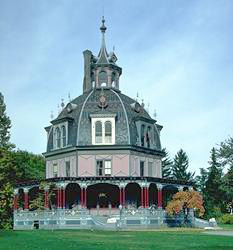 The classic Victorian styles (Gothic Revival, Italianate, Second Empire, Stick Style, Romanesque Revival, and Shingle Style) were created by professional architects, and were built mostly by the well-to-do. But the lower reaches of the middle class certainly shared the same Victorian urge to live in a fashionable house, and if they couldn't afford a professional architect, well. They could design the house themselves, or have a local carpenter do it. In either case, the design was likely to be an unprofessional but possibly still charming pastiche, including elements of styles that were still currently fashionable among the upper crust, and elements of styles that definitely were not. Also, the house would naturally tend to be smaller and plainer than the what the wealthy could afford. There is some debate as to whether another style of the 1890's, Colonial Revival, is a true Victorian style, or the style which marks the end of the Victorian era. Whatever the case, Colonial Revivalism was certainly a reaction against the extremely elaborate houses which had come to symbolize the High Victorian period. Colonial Revival houses looked back to the Federalist period for inspiration, and are characterized by simpler, more symmetric lines and much less gingerbread than most other 19th-century houses. 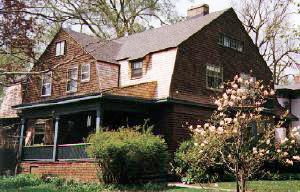 The style had much in common with the Shingle Style, which began to appear at roughly the same time. Colonial Revivalism eventually evolved into the Four-Square and bungalow designs of the early 20th century. The interiors of Colonial Revival houses (especially those built before the turn of the century) are often very traditionally late Victorian, however. Text copyright 1998 by David Taylor. The 1st, 2nd, 4th, 6th, 7th, 8th, and 10th photos on this page (counting from the top) are from the Corel CD-ROM, "Victorian Houses". Permission is NOT granted to reproduce the Corel photos in any manner for any purpose, as I am not the copyright holder.